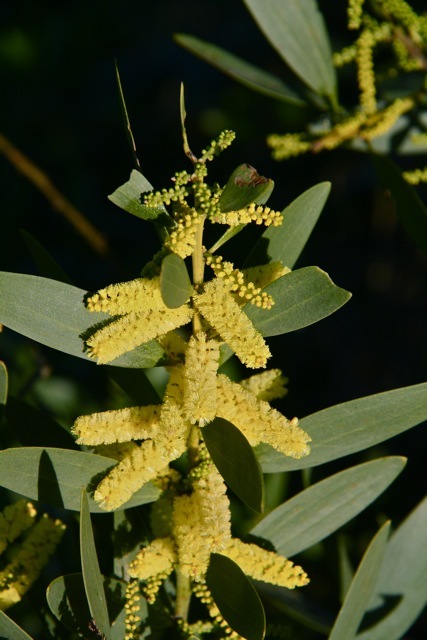 This small tree boasts little yellow bottle-brush flowers scattered among long, blade-shaped leaves. Sydney golden wattle (Acacia longifolia) is native to Australia, but has naturalized here in southern and central California. It is distinguished from many of the Acacias by having leaves that aren’t feathery or divided, and also by having long rod-shaped spikes of flowers, instead of puffy pom-pom-shaped balls. 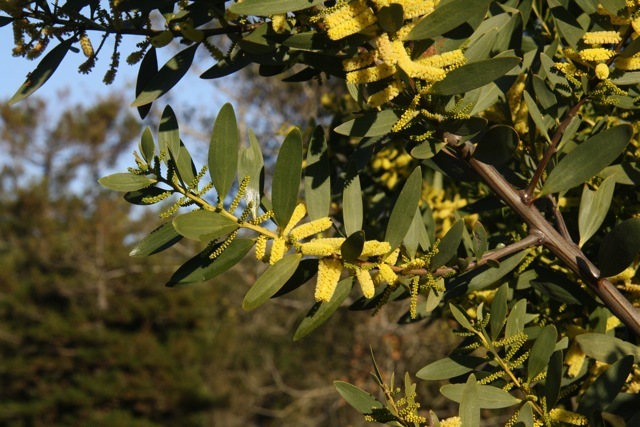 The golden wattle is a fast growing plant, and is used in Australia and other countries to stop erosion. This member of the Fabaceae family can fix nitrogen through a symbiotic relationship with bacteria that live in nodules in its roots. The flowers, seed and seed pot are all edible. The cooked flowers have a light fragrance and are used in fritters. Flowers also can be used to make a yellow dye, and the seed pods make a green dye. 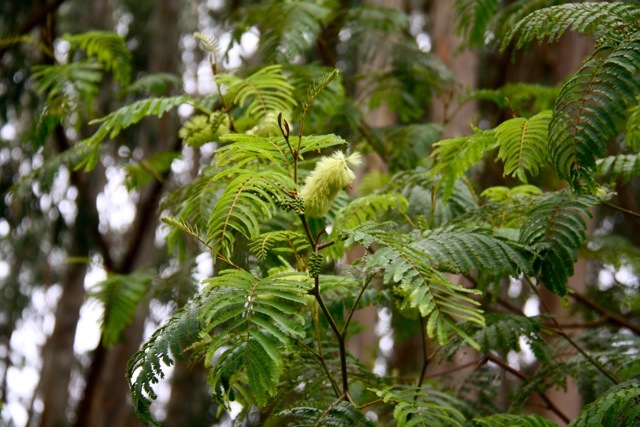 None of the Acacias are native, and many are invasive here in California. A rugged little beachgoer, this wild strawberry spreads across the sand via long stems called runners. Where these stems touch down and root, a new little plant will start up–spreading its small scalloped leaflets toward the sun. 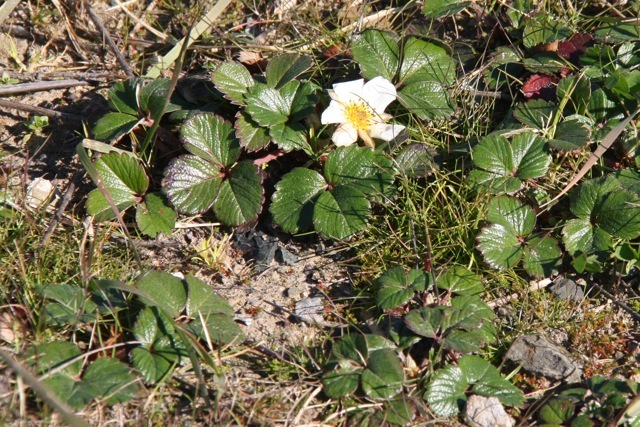 Beach strawberry (Fragaria chiloensis) is a common sight in sandy seaside spots. Its cousin, wood strawberry, looks similar but has leaves that are thin and slightly hairy on the top. By contrast, beach strawberry has thicker, hairy, and distinctly glossy leaves. As their names suggest, the two also grow in different habitats. Both are edible. Heads of little yellow flowers decorate the dunes. This is sand verbena, or Abronia latifolia. Its prostrate stems are sprawled like sunbathers across the sand, raising their leaves and blossoms like a lazy wave. 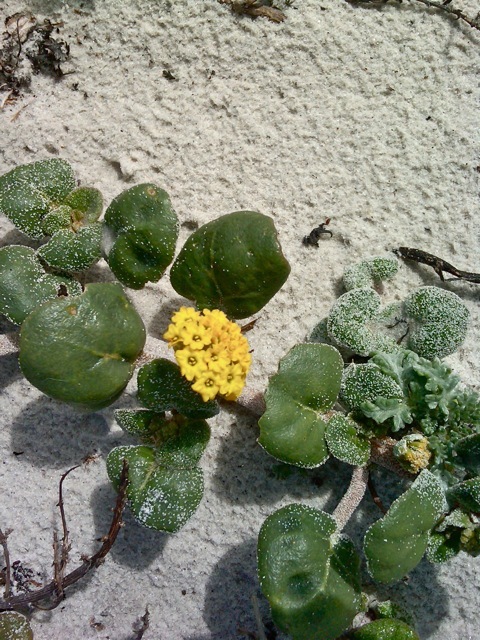 The flowers are some of the showier native dune blooms, and have a lemon-verbena scent. The succulent, scalloped leaves are pretty in their own right–especially when lightly dusted with sand. 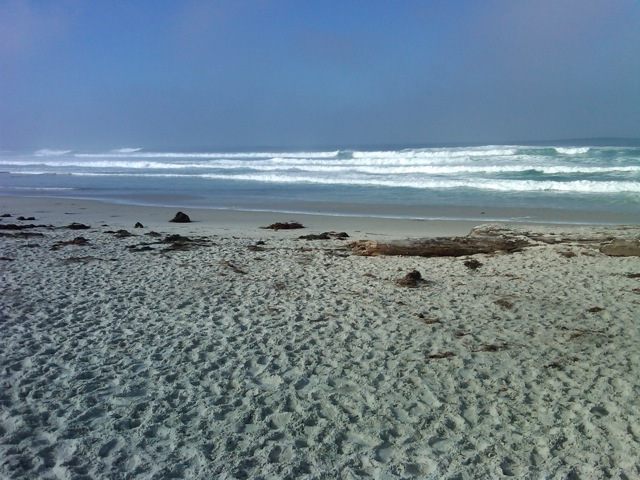 You can find this little flower on the dunes and strand, and in coastal scrub, from Santa Barbara to Washington State. Its long, stout roots are edible and somewhat sweet. They were usually harvested in the fall by coastal tribes. I saw spotted this verbena on the white sands of Asilomar during EcoFarm–a great conference, and a lovely state park and beach to visit at any time! This vividly-named fungus is common on dead or dying oak trees–a nearly ubiquitous sight these days thanks to Sudden Oak Death. 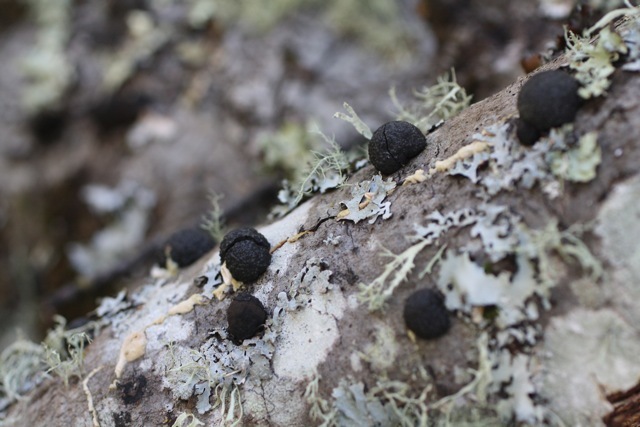 Cramp balls (Annulohypoxylon thouarsianum) look like a lump of black charcoal popping from the bark of the tree trunk. If you split one open, though, it is grey-brown and woody. There are similar-looking fungi in the Daldinia genus, but cramp balls can be distinguished from these by the presence of tiny chicken-skin bumps. These fungi are a telltale symptom that the tree is ill or dying; it’s often a symptom of advanced Sudden Oak Death, but can also be present on uninfected trees. After a month of keeping my eyes peeled, I finally found a patch of this little brown-striped lily. Fetid adder’s tongue (Scoliopus bigelovii) is easy to miss–it grows low to the ground, with flowers that blend in with the duff. But up close, it is spectacular! The three showy petal-like sepals are delicately striped with brown and white; they arch backward away from the three actual petals that rise upward like slim prongs. At the center of this confection is the three-pointed star of the pistil, and three purplish nubs of stamens which are nestled closely above each sepal. I don’t actually think fetid adder’s tongue smells all that bad–but it certainly has a reputation for being stinky. Its fragrance is musty, like old mushrooms and forest floor. Which is exactly suited to the purpose of attracting the fungus gnats that are its pollinators. Each gnat rummages toward the smell, covering its head in pollen in the process. You can easily watch these little flies as they doze and flit among the flowers. This plant is also sometimes called slink pod, because as the seeds develop the weight of the pod causes the stem to droop. Eventually it touches the ground, and often will root there–giving rise to a new plant. The two leaves of fetid adder’s tongue also are distinctive–these pointed green ovals rise from the duff as the flower is blooming, often unfurling after it is past its peak. Once they emerge you can recognize them even without the flower present, since they are blotched all over with purple bruise-colored spots. Thanks to Amelia and Doreen for giving me tips on where to find these! These little lilies bloom in the dappled sun of an oak-covered hilltop. They are one of the earliest flowers to bloom, with their creamy star-shaped flowers opening above trailing ribbons of green leaves. But don’t be tricked by its beauty: the star lily (Toxicoscordion fremontii) is also known as death camas, and with good reason–it is highly poisonous. Blue-purple blossoms are scattered among velvety leaves that rise from the ground like the perked ears of some alert subterranean beast. Right now, the young leaves are a beautiful palette of color–pale red veins spread across soft greenish purple. As they mature, the leaves deepen into pure emerald. This is hound’s tongue, or Cynoglossum grande, a distinctive forest companion in the spring–often seen growing in oak woodlands, sometimes alongside yesterday’s plant, Indian warrior. Once you learn to recognize them, even the leaves are hard to mistake for anything else. Hound’s tongue flowers are simple yet pretty, ranging in color from rich blue to pink to (very occasionally) white. Each petal buckles up along the inner rim, forming a raised ring of humped white bumps around the pistil and stamens. Indigenous Californians roasted the root as food, and grated it as medicine to treat stomach aches, burns, and venereal disease. Low spears of ruffled purplish leaves sprout from the dappled forest floor of an oak woodland. Small burgundy flowers peer from among the leaves, each shaped like a flattened hood. 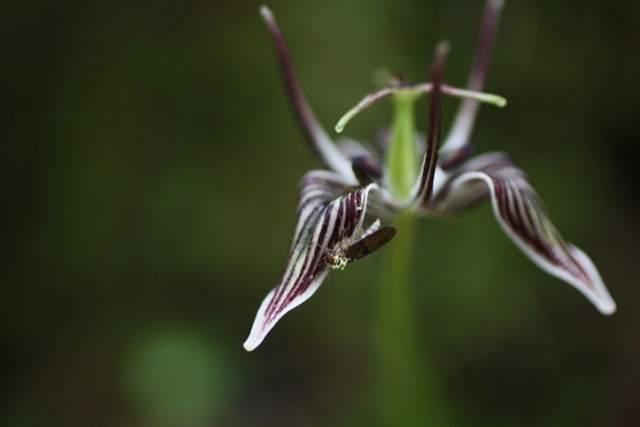 Three diminutive lip-like petals open upward on the lower edge of the hood, and a strange little proboscis dips downward–shaped like a single eye-stalk from a snail. 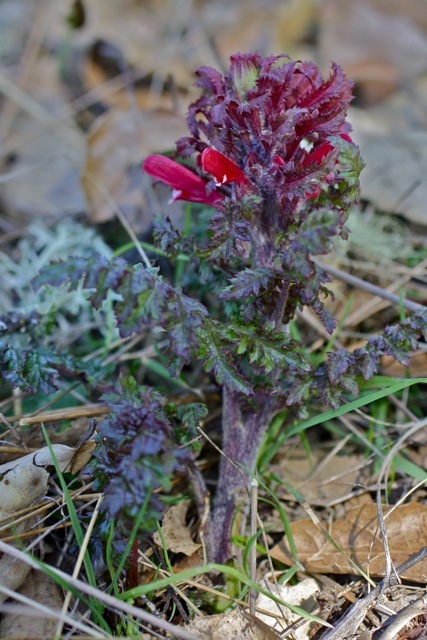 This is Indian warrior, or Pedicularis densiflora, a common sight blooming in woods and chaparral from January through early spring. 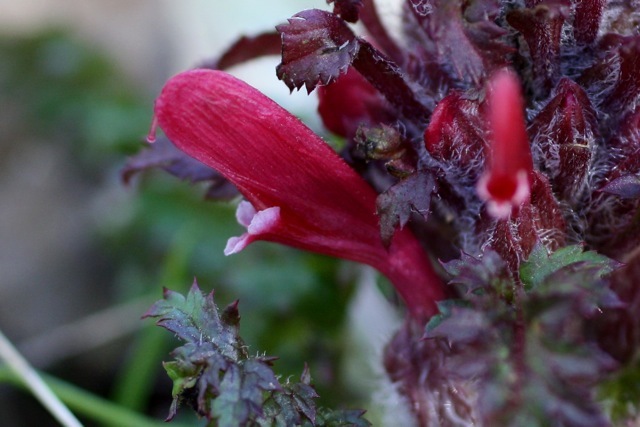 Other cousins of this little flower also have strange appendages on their blossoms; most notable are two species of elephant’s heads that grow in the eastern part of the state–their flowers truly resemble the flared ears and swooping trunk of an elephant. Gray-green draperies of lichen hang from a coastal pine tree. Easily mistaken for old man’s beard, this scruffy lichen is found growing along the coast and in inland areas with fog. If you look close, you’ll see that the strands of lichen are composed of lacy, net-like pieces–instead of single, hair-like strands. This is lace lichen, or Ramalina menziesii. Though it looks like old man’s beard (Usnea) and Alectoria, the presence of netting–as well as the lack of a springy central cord–are distinctive. A small tree stands along a trail on the outskirts of town. Though it looks like an acacia tree, with its feathery leaves and yellow tufts of flowers, it’s actually Albizia lophantha. In both types of tree, the yellow tufts are actually composed of many threadlike stamens. But acacia has round balls-like flowers, each less than 1 centimeter across. Stink bean can be distinguished by its spike-like flowers that are about 2.5 centimeters across–and stamens that are united near the base. This Australian native is also known as plume acacia, a nod to it’s more well-known cousin. It was probably introduced as an ornamental–and though it has spread into the wild, it hasn’t gone far and isn’t listed on California’s list of invasive plants. For this reason you’ll usually see it in “waste places”, the weedy ecological hinterlands that are on the edge of developed or heavily used places.